This boat was purchased by Pamela Lenehan in September, 2006. Pam is making the boat available for the Herreshoff Museum Sailing School. Previously, Wasp was owned by Andy Mutch and his wife of Annapolis, MD. The sailed her in Linekin Bay, near the summer home in Boothbay. She was restored by Rick Prose of West Boothbay Harbor, Maine, Finest Kind Wooden Boats, in 2002. She was bought from the Herreshoff Museum. They went on a trial sail with Halsey Herreshoff. She is an ‘improved model’, which means she has wider sidedecks, copper flotation tanks, a raised lazarette, and an over-the-transom tiller. According to Andy, Halsey told him that Sidney designed the improved model after his father capsized a boat in Bermuda or Florida. 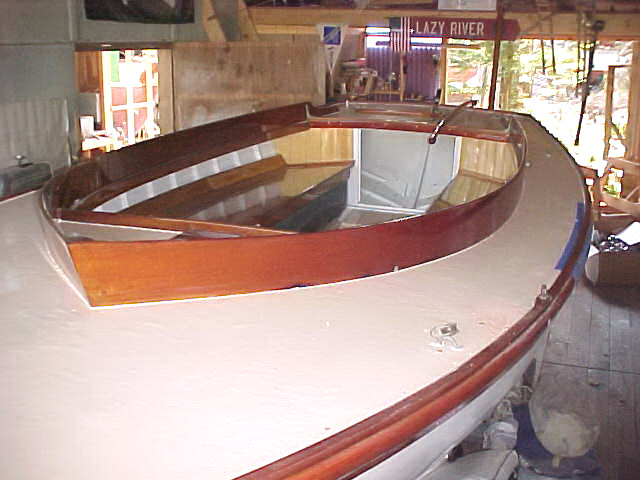 She originally had mahogany transom and coamings, though Rick replaced the transom with white oak.